I made this belt ages ago after seeing a similar one on Etsy. My first thought was, "I can actually do that!" Afterwards it sat around. I wasn't quite sure how to wear it. I saw it sitting in my closet and pulled it out a while ago determined to try and wear it. By pairing the belt with coordinating colors I hope I made it work! It draws the red in the tights upward to the rest of the outfit and pulls all the pieces together. I really think I need to wear it more. I see statement necklaces everyday, but a statement belt is a bit more unique! Is a DIY on this something you'd like to see? Cynthia from My Rose Colored Shades is co-hosting this week. She exudes elegance, style, and class. I wish I could look like that half the time I get dressed. I would even settle for a quarter of the time! Cynthia shares delicious recipes, beauty and fitness posts, and more. Make sure you go visit her! You made that belt? I was going to comment on how unique it was and my eye was immediately drawn to it and then I read that you made it. Officially in awe!! You made that belt? How cool It's cot such a great pop of color for this dress! So cute! Love the fun belt and the red tights! What a cool belt! I love the pop of color with the tights to bring out this beautiful accessory. :) Thanks for the Link Up! What a fun outfit. I love how you mixed it up with your tights color. Such a pretty belt and now you're really making me want some dark red tights. I adore the belt what a cute look. i need more tights in my life! love these!! Your belt is amazing. I would love to see how you made it. This belt is so awesome! I'm really impressed that you made it. Adds such a great touch to this outfit! Loving the wine coloured tights, too. I love the whole look, especially the red tights. I'm a huge fan of cored tights. Well, you also exude elegance, style and class in this fine outfit. The belt adds so much more to this pretty outfit. But I agree Cynthia's style is lovely and so is her blog in general. She does it all - super mom. That belt is something I can actually do. I think I have an idea how but I personally would love a DIY. I do have (store-bought) a couple of statement belts actually. Is that a ribbon for the sash part of the belt, like a grossgrain ribbon? I love the pop of color in your tights. 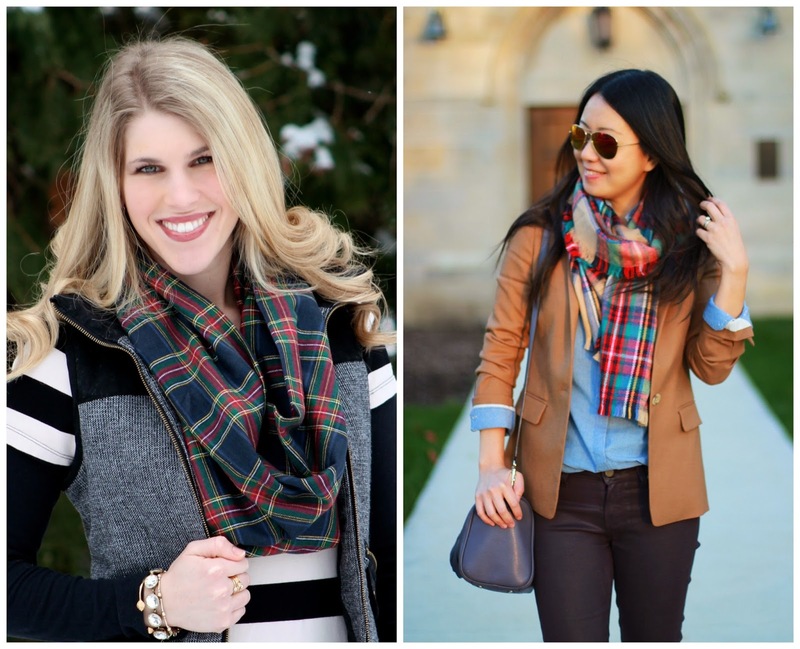 Great winter look! You have such great DIY items, this belt is so pretty and I can see something like this from Anthro. Oh wow love that belt - chic DIY!!! Your DIY never ceases to amaze me!! 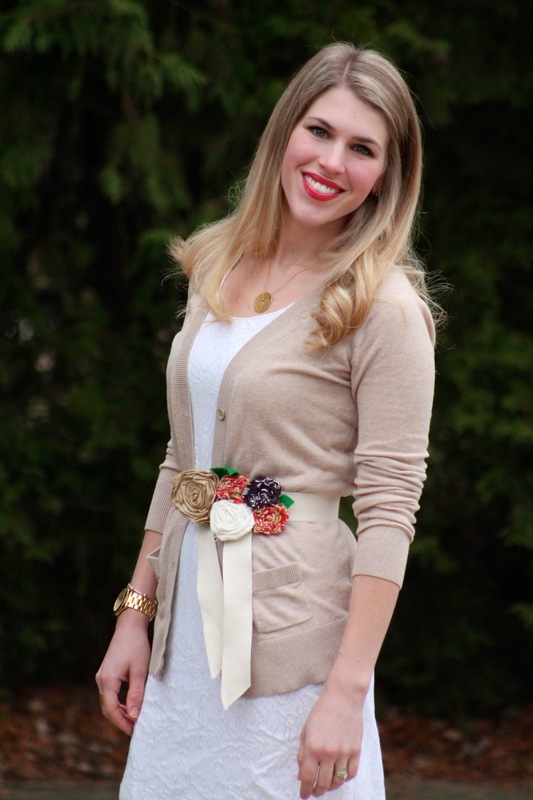 I love it--and you styled it so perfectly :) Girly and romantic--a great date night outfit or perfect for Vday1! You look so pretty! I love that belt, it's adorable! The sweater and dress look so good together! Wow, I had to pin it! 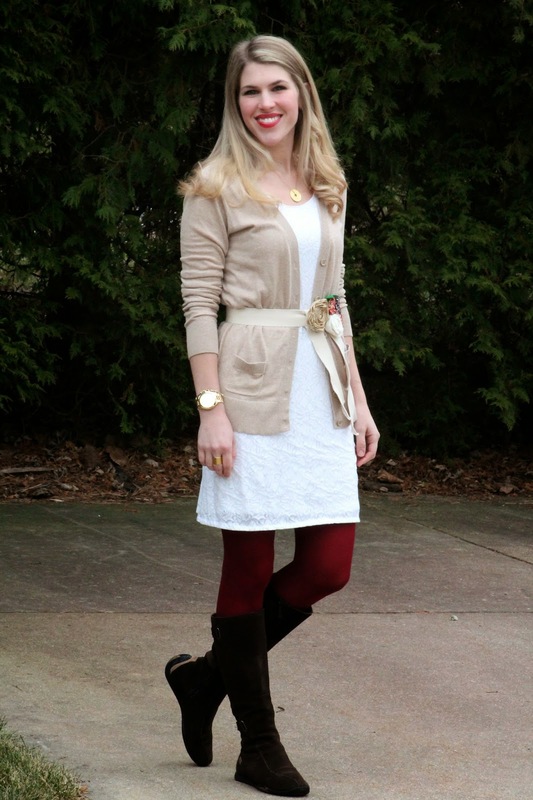 You mix those colors seamlessly, and your DIY'ed belt is perfect for this outfit! Oh my goddness- that belt is TOO cute! You need to open an Etsy shop girl! Please tell me you have a tutorial on this...so gorgeous! Gorgeous look, Laura! I love the belt with the red tights. You DIY'd that? Omg, please post a step by step! I've been trying my hand at belts lately too but it's SO much harder than it seems. You made that rosette belt? I am in love! So pretty and frilly and girly for Valentine's Day! I really like the colored tights, they go great with this otherwise neutral outfit. So I've had red tights for a few years now and barely wear them, but you're definitely making me reconsider with these knock out looks! What a cute belt! I am so impressed that you made it yourself! Thank you so much! It's super easy and cost like $5! I'll have to get a DIY post put together! Absolutely lovely look -- and belt! I agree, it works so perfectly with this outfit and tying in the red from the tights. The belt is so pretty! I totally get the styling conundrum, it seems like the kind of piece that will only really work well with a dress. What a gift you have to be able to take something and make it beautiful! Both the dress and belt are stunning additions to your wardrobe! Gosh that belt is awesome! I can't believe you made that! I think you styled it well here and the red tights add the perfect finishing touch. so dreamy! I know, that word is so old, but it fits. dreamy! Such a fun outfit, Laura! I really like the belt (I probably couldn't get away with something like it, but I love it on you!!). I have a white lacy dress that I've been saving for the spring, but this outfit is making me think that I should probably give it some love during the winter!